While consuming insects as a vital source of protein, vitamins, and minerals has long been a part of non-Western diets, bugs have had a hard time making the leap onto many dinner plates in North America and Europe. 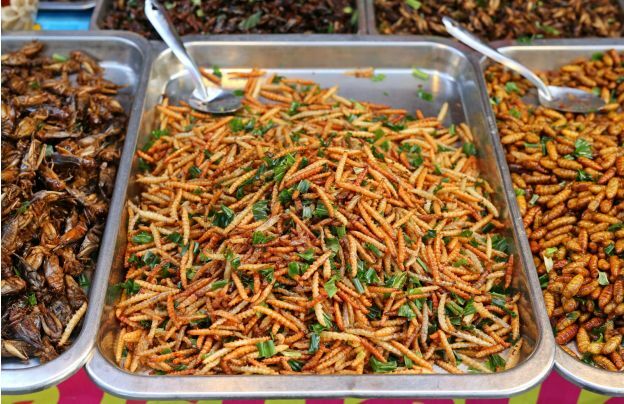 The Food and Agriculture Organization of the United Nations has been pushing for the consumption of edible insects in countries around the world since 2003. Among their reasons is the environmental impact of raising insects for food compared to pigs, for example. Not only do they require less water and feed, but insects also require less farming space than traditional livestock. Insects release fewer greenhouse gases as well. In other words, many more people can be fed for a much smaller carbon footprint on the local and global environment. From an environmental standpoint, it's a pretty solid argument, but other than novelty items, many of us don't see too many insects on the shelves—at least not for sale. This is where clever marketing comes in. The most famous example of how marketing can make food go from gross to gourmet is lobster. Once seen as a pest, the fate of the lobster changed when the railroad brought the crustacean to the West. Unaware of its reputation, it became a hit with travelers. Soon, top restaurants were offering lobster on their menus. The rest, as they say, is history. When it comes to insects, a recent study shows that at the end of the day, a compelling environmental argument isn't enough. Sure, people may care about the environment, just not enough to eat cricket consommé. Instead, they found that the argument should focus on how good insects taste. This way, rather than eating bugs simply because it's the "right thing to do," you're eating them for their flavor. It's not a green choice, it's a foodie one. It's the experience that matters, not the environmental or health benefits. In fact, back in 2015, award-winning chef Rene Redzepi of Noma in Copenhagen made headlines when he served shrimp sprinkled with live ants at a pop-up restaurant event in Tokyo. Noma had been named the best restaurant by Restaurant magazine 4 times—foodies trust Redzepi's judgment. 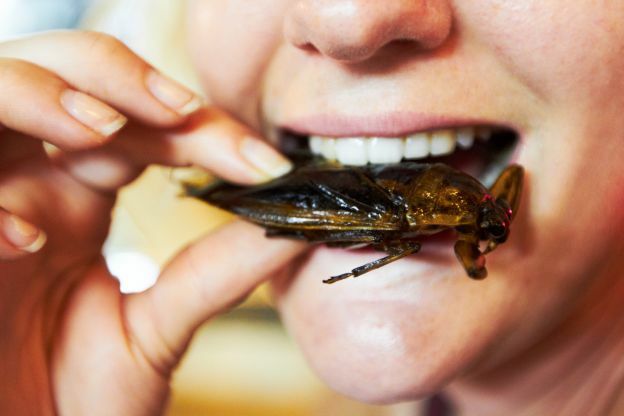 The question remains: Why is 2019 the year we really might start eating bugs? In addition to the change in marketing strategy, edible insect advocates have realized that the whole thing goes down a lot better if we don't actually have to see the bugs. Some companies ground crickets into flour; some chefs turn them into a sauce or a crispy topping. Integrating insects into things we already eat has helped make the idea a lot more palatable. Celebrity chef Marcus Samuelsson famously made "cricket fried chicken" on The Late Show with Stephen Colbert this past summer. A company out of Montana makes "chocolate chirp cookies," their version of the classic cookie with an extra jumpy ingredient. Others suggest it could even be as simple as starting to refer to the insects by a different name, like we do with beef or pork. It would give us more distance from the creepy crawlers hidden on our dinner plates; it might be enough to distract us until we can actually taste the dish and make an informed judgement. All these things help to make edible insects more accessible and attractive in our everyday lives. The day is coming when they might no longer be taboo or daring, but as common as sushi. 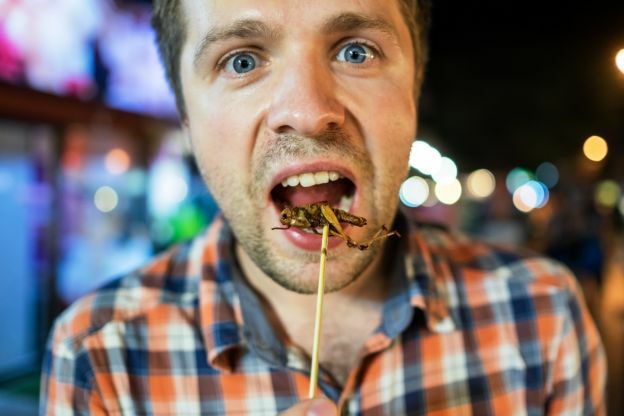 Keep your eye out for opportunities to try insects this year, and you just might be pleasantly surprised! Hungry for more? Here are America's 30 Best Lobster Rolls.